It’s 8 a.m. and both of my girls are at work. Allison, my oldest, just graduated from college and is employed full-time at a company that is what I consider “old school”. “Old school” benefits that include health, dental, vision and a 4% match on 401(k) contributions and a defined benefit pension on top of that. My youngest, a rising junior in college, is at her first job of the day, teaching special education three-year-olds at a summer camp and then will come home and turn around to get to her second job of the day, a hostess at a restaurant where she has worked for the past 4 years. If you ask them why they work so hard, they will tell you it is because they have to. And they would be right. We told them in high school that they would need to cover their wants and needs when they started college. Their dad and I saved for decades to cover tuition and room and board at college – but everything else was their nut to crack. They understood and we helped them by supporting their job hunts early in life. 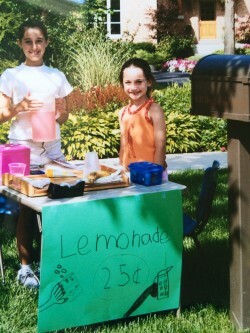 Before age 16, they had lemonade stands, garage sales and rock sales. Yep, it turns out that grandmas and grandpas will buy pretty much anything that a really cute grandchild offers them for sale – no matter what the price. In the early years, it was amazing to them that they could earn money that their parents did not give to them. They say it was exhilarating to have money they could do what they wanted with as they had earned it on their own. At the legal hiring age, Allison hiked to Market Square, where all the shops are in our community, and walked in to each and every one that looked interesting, and asked to fill out a job application. She eventually got a job at a local shoe store (hated it), then a local restaurant as a hostess (not enough money), then as a waitress at a bigger restaurant (loved the upside potential of waiting tables), and then finally a 9-5 at a local law firm during the summers after her sophomore and junior years of college. Amanda followed her sister’s example and pretty much did the same thing. She also added a little “DO” in donate by making time for mission trips and volunteer hours at a special education camp. But she did work enough paid hours to cover her bills. Bottom line, both girls say that paying their way led the way to self-respect. If a sorority fee (theirs to cover) was unreasonable, they appealed for a reduction. If a class was full that they needed to be sure they graduated in 4 years (all the time and money we gave them), they advocated for themselves and got in. If they wanted to buy the 10th pair of leggings, well, it was their money after all that was paying for them. Was it the lemonade stand? Maybe. But, more likely it was the encouragement to earn money that started this all on the path to success. And the responsibility to cover their wants and needs did a lot to motivate them as well. The surprising outcome was how much self-respect resulted when they realized that they themselves had taken care of their bills. So, give your kids encouragement to earn and respect them enough to hand over the bill of life with a knowing look that tells them you know they got this. It’s amazing how powerful and empowering a message that is for kids.